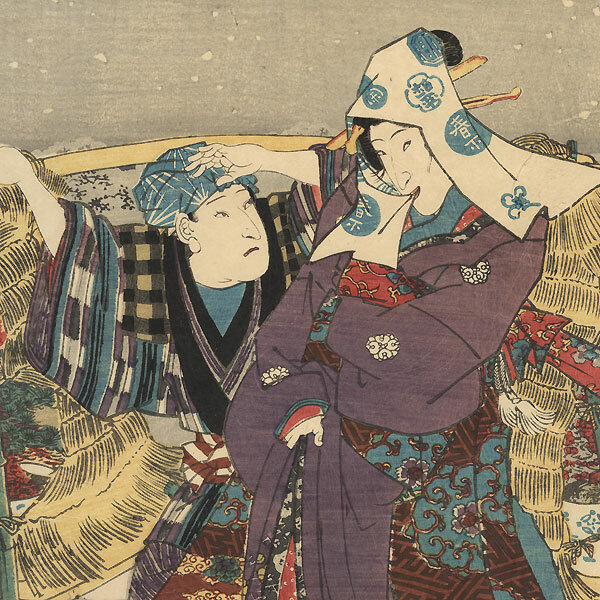 Comments - Handsome kabuki scene of two men encountering a beauty and a vendor in the snow. The woman tilts her head coyly as she smiles, the edge of her blue and white head scarf caught between her teeth. The bonsai vendor rubs his head in a puzzled manner, his miniature potted plants hanging from a yoke over his shoulder, wrapped in straw matting for protection against the cold. 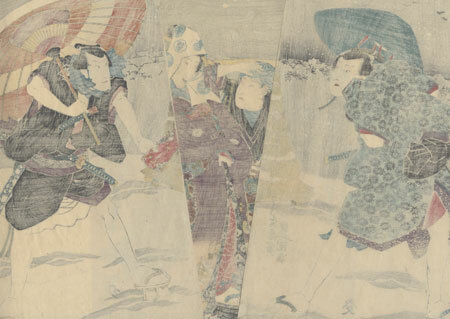 The fellow at right, grab's hold of the beauty's obi, leaning forward with an angry frown, while the young man at left watches the scene with a concerned expression. From left, the actors are Ichimura Uzaemon XII as Funakoshi Juemon, Bando Shuka I as Kewaizaka no Kashiku, Ichikawa Kodanji IV as Obu Rokusa, and Ichikawa Danjuro VIII as Kozaro Shichinosuke. Snow falls through the gray evening sky, with birds in silhouette at upper left and the rooftops of the city in the distance. An attractive design with a lovely winter setting. Condition - This print with excellent color and detail as shown. Three separate panels. A few small wormholes, repaired. Slight soiling, a few creases and small marks. Please see photos for details. Nice overall.